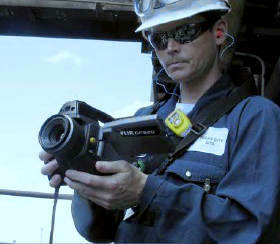 In light of legislative changes governing how organisations should monitor their industrial emissions , FLIR Systems has written a new informative guide: `Top Tips : How to get the most from Optical Gas Imaging (OGI)’. One of the most significant advances in infrared thermographic cameras over recent years has been the introduction of Optical Gas Imaging. OGI cameras use spectral wavelength filtering and sterling cooler cold filtering technology to visualise the Infrared absorption of VOC/Hydrocarbon ; SF6 ; Refrigerant, Carbon Monoxide and other gases whose spectral absorption matches the response of the camera. By using OGI technology - industry is now able to incorporate a ‘Smart LDAR’ program that safely and efficiently visualise gas leaks. OGI has allowed industry to reduce emissions thereby enabling operator owners to conform to strengthening environmental emission regulations, save money as part of a much more efficient process, but most importantly improve the safety of their assets and their workers. 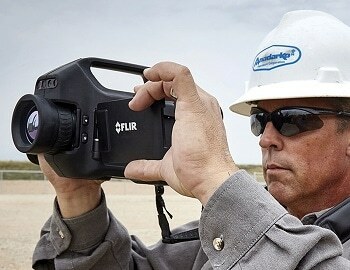 The new FLIR ‘Top Tips’ guide offers advice on understanding your application needs ; Taking account of environmental conditions ; Learning what OGI can do for you ; How to use OGI as part of a LDAR process ; Improving safety ; Complying with incoming legislation ; How to work with Permits and Justification for OGI based on return on investment.